Your Friday Morning Circuit Bending News Digest. Lets try this out and see how it goes. I’m gonna post a bunch of news just to catch up on whats been happening recently. I don’t really know this Idolator.com website, but they seem to know about Circuit Bending festival called Bent Fest and also prefer it to “person’s face glowing in the screen of a laptop“. This year NYC, Minneapolis, and LA will provide the backdrops for a craze thats sweeping the nation. Doctor Popular who runs Drown Radio has just dropped a CD, “Me Geek Pretty One Day“. Circuit Bending sounds mixed with a dash of Casio and Crunk. Check it out here on The SixtyOne. Circuit Bending Workshop is happening on April 15th, 2008 in Boston Area as part of the local Dorkbot. Hosted by Jimmi P Rogers who built this pretty awesome looping guitar and posted a schematic interfacing with a RadioShack recording module which uses a transistor control the record function only when a sound is made. ( Photo of FoodTeam By Julie Cisler taken at the LoFi Fest 2007 ) a great gallery of her work from that event is located here. 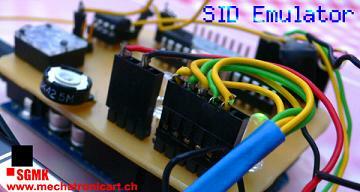 If you are in Zurich, Switzerland on April 16th-18th please check out this interesting 8-Bit SID Emulator workshop. Apparently an Amtel Microcontroller can be programmed to sound kind of like a SID chip, because well SIDs are hard to find anymore, and fit onto an Arduino Shield making it a SIDuino. Please register with info@sgmk-ssam.ch for more info about the workshop.